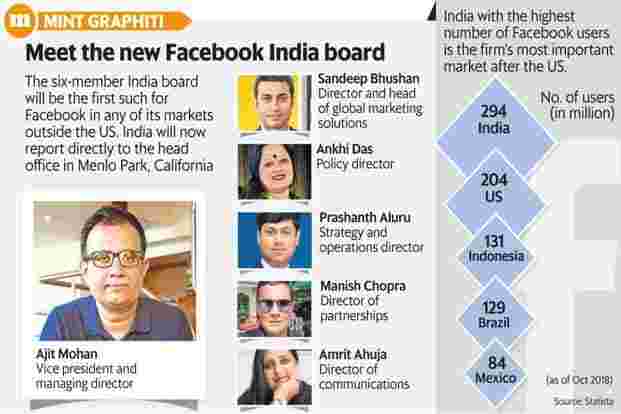 Mumbai: Facebook, in a major overhaul of business structure, has carved out India as a separate region with a six-member board that will be treated on a par with the one at its Menlo Park headquarters in the US. The India board will also be the first such for Facebook in any of its markets outside of the US. The local office will also report directly to Menlo Park and will no longer be part of Facebook’s Asia Pacific operations. Although the elevation of the status of the India office is a reflection of the country’s growing importance, it is also a reaction to tightening regulations on foreign internet companies in India following a spurt in the spread of deadly rumours on social media. One of the requirements for such companies was to incorporate a local entity. “The changes mark a significant step, reinforcing Facebook’s commitment to India and will enable more local accountability, faster and efficient decision-making, and closer connection with the headquarters," said a person directly aware of the matter. India is the largest market for Facebook outside of the US and with general elections due by May in the world’s largest democracy, Facebook will need to show deeper commitment to prevent political actors from using the platform to spread fake news to manipulate elections. The changes at Facebook are also expected to accelerate localized consumer products and stronger partnerships with stakeholders in the country, the person cited earlier said. The new Facebook India board comprises Ajit Mohan as vice president and managing director; Sandeep Bhushan, director and head of global marketing solutions; Ankhi Das, policy director; Prashanth Aluru, strategy and operations director; Manish Chopra, director of partnerships; and Amrit Ahuja, director of communications. Siddharth Banerjee, director of global sales organization (customer partnerships and agencies), and Archana Vohra, director of small and medium business, will also join the company but will not be part of the board and report to Bhushan. Mohan, who joined Facebook from Hotstar earlier this month, will report to David Fischer, who is part of Facebook co-founder and chief executive Mark Zuckerberg’s core team and oversees business and marketing partnerships globally. “We are excited about the formation of our new leadership team under a new organization structure in India. We have appointed Ajit Mohan to the role of VP & MD (vice president and managing director) of Facebook India, who will be supported by a strong leadership team comprising of some new roles that have been created to bring greater focus to India," a Facebook spokesperson said in response to a query. “The new operating model will help us create the best experiences for people in India, drive deep partnerships with diverse stakeholders, focus on exciting consumer products and support the agenda of fostering entrepreneurship and small businesses in the country."